Onset Mountain was founded around 1969. 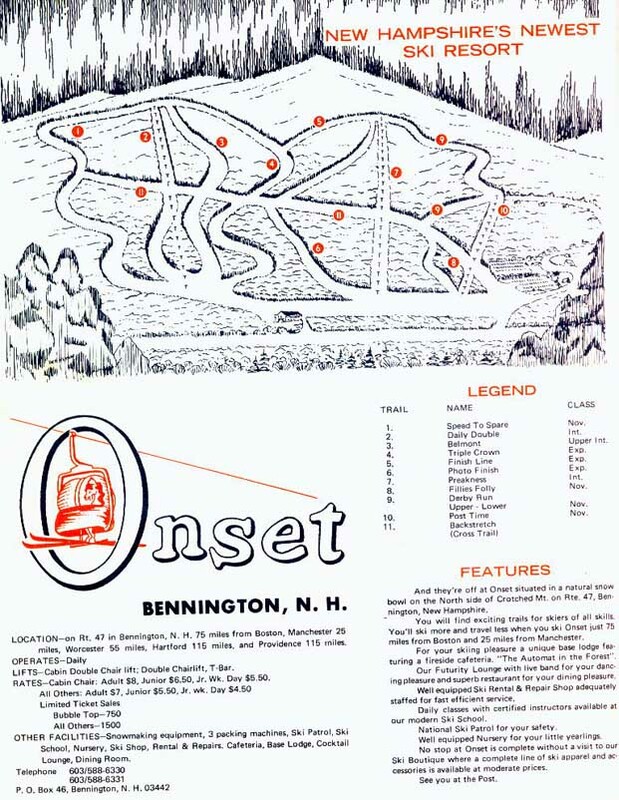 It was billed as New Hampshire's Newest Ski Resort around 1970. This area had an interesting feature: a cabin double chairlift. Covered double chairs are rare to be found in New England...the only place I know of that had one is Mt. Snow, which had several. Most of the trail names were after racing terms, like Daily Double and Finish Line. Onset was certainly an interesting area. It likely changed in management in 1977 and received a new name: Bobcat. This would be short lived, as it would merge with nearby Crotched Mtn several years later. A new T-bar was installed during this time, called the Summit T-bar, and accessed terrain above the bubble chair. The coolest part about Onset is that it merged with next door Crotched and became a very large (in breadth) ski area during the 1980's. Trails were interconnected, and the area had a Killington-ish feel to it. Onset and Crotched both closed during 1989. Today the two double chairs remain, but neither shows signs of having a bubble. To read more about what happened to this area, click here to read Crotched Mtn's history. Here's the trail map from 1969-1970, thanks to Dave Hilton. Features: Area operates daily, night skiing, ski shop, area restaurant, snack bar, nursery, 3 lifts (2 double chairs, 1 T-bar) with 3100 per hour capacity, 13 trails, parking for 700 cars. No snowmaking equipment. Ski School: 12 instructors, 2 certified. Rates: Weekday: $6.00 adult, $4.50 junior. Weekend: $9.00 adult, $7.00 junior. Season: $150.00 adult, $90.00 junior. Midweek special: $6.00 for lift, lesson, and rental (excluding holidays). Onset changes its name to Bobcat. Same as what it will be for 1980. It was now called Bobcat Ski Area...for the last year. The area merges with Crotched in this year, and sees all of its trail names change...for more on the story of Crotched, click here.